It’s been a decade since Iceland went all-in on tourism, a rapid and drastic expansion of the industry that was initially a bid to salvage the economy from the 2008 financial crisis. The strategy worked so well that it effectively overwhelmed Iceland’s existing infrastructure, but the country’s tourism boom also benefited its closest neighbor, Greenland. How big was Iceland’s boom? According to the UN’s World Tourism Organization, 2.3 million tourists visited the country in 2017, outnumbering locals 5 to 1. Over on Instagram, that digital arbiter of trends, the hashtag “iceland” numbers at 9.5 million and counting. Basically, it’s like everyone’s been there — check your own timeline and count how many of your friends have bathed in the Blue Lagoon or chased waterfalls. Social media certainly plays a role in marketing Iceland to the adventure set — it seems as if the country has no bad angles — but this has translated IRL into crowded locales, higher prices and less-than-intimate experiences. 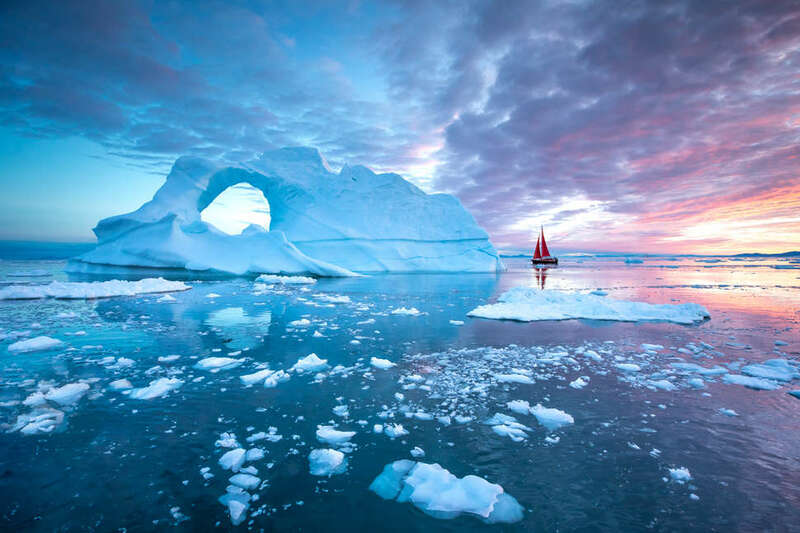 Greenland, on the other hand, offers adventurers a reasonably quieter experience. Outdoorsy types, rejoice. 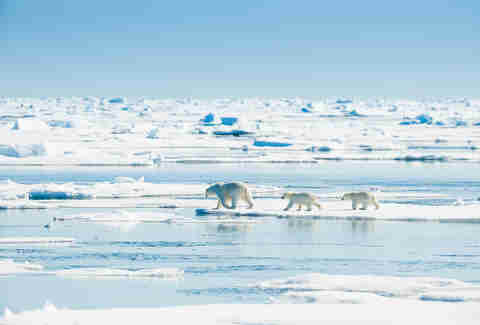 Offering clear views of the Northern lights, kayaking through glaciers and encountering numerous wildlife (polar bears! Musk ox! 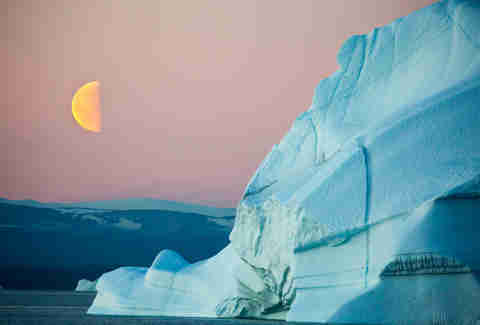 ), Greenland is as close to an unmarred landscape as one can get. Why Greenland, and why now? Greenland is sort of the Midwest of the planet, in that everyone flies over it but few consider visiting. It’s more than 20 times the size of Iceland but has one-sixth the population. At more than 836,000 square miles, Greenland is the world’s largest island, but home to only around 56,000 people. For comparison, my hometown of Littleton, Colorado, population 46,000, is less than 14 square miles. Thanks to the Iceland tourism boom, there are cheap flights via Reykjavik all the time; from Reykjavik, the flight to the small airport at Constable Point on East Greenland is only about an hour and a half. The airport sits near the mouth of Kangertittivaq, or Scoresby Sund — the largest fjord in the world. 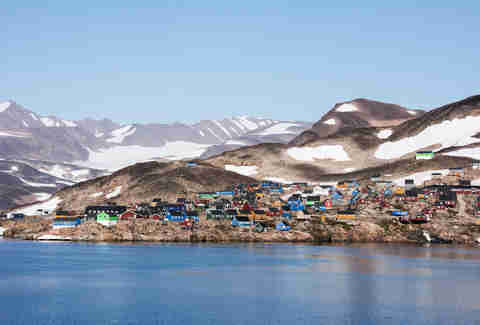 Nearby is Ittoqqortoormiit, the northernmost community in East Greenland. Otherwise, no one lives here. Western Greenland has seen an increase in tourism in recent years around Ilulissat and the capital city of Nuuk, but the East coast remains largely off the grid and inaccessible as far as travel goes. You mostly hear about the Antarctic ice sheet, but our planet has two such sheets, the second covering most of Greenland. As there’s not much in the way of land-based infrastructure (most is concentrated on the West coast), Scoresby Sund can really only be seen by boat. There are many excellent cruises in the world, but I am normally opposed to them due to the fact that while I do not fear enclosed spaces, I do fear enclosed spaces promising Organized Fun with strangers. This fear, however, is not as strong as my desire to spend as much time as possible in the Arctic Circle, and when Quark Expeditions invited me on a 10-day trip around Scoresby Sund they also turned me into a person who was excited to go on a cruise. It helped that this was not a typical cruise. Small adventure cruises (maybe 100 people, including crew) like this are growing in popularity as an alternative to the cartoonish, supersized outings around the Caribbean etc. Quark specializes in polar expeditions -- both Arctic and Antarctic -- and are one of very few cruise lines that go to Greenland’s east coast. The ones that do tend to make it a drive-by on routes that focus on other destinations like Norway. 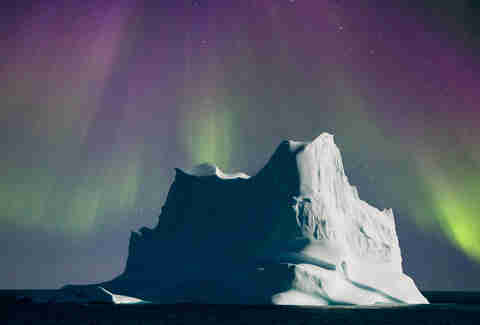 Packages vary; the specific trip I joined, “Greenland’s Northern Lights,” runs $6,695. You’ll want to budget a few hundred dollars more for add-ons like kayaking, drinking, silent auction-bidding and, of course, tipping. Quark’s expedition crew are all knowledgeable in different areas — history, marine biology, glaciology, and photography — so the cruise feels very deliberate — rest assured, you’re not just getting mindlessly steered around. An average cruise day would include breakfast followed by a morning activity like a hike, kayak expedition or Zodiac cruise, an up-close tour of icebergs and glaciers upon inflatable boats. After lunch, afternoon activities continue in the same vein. The itinerary is pretty flexible, contingent on weather and unexpected experiences like bear sightings. Wait, will I see polar bears? Polar bears only evolved around 150,000 years ago, but are predicted to go extinct within the next couple of decades, a sad, tiny blip in this planet’s history. And sure you can see them in zoos, but seeing them in the wild is something else entirely. On day one of Quark’s cruise, we saw 11 polar bears -- females with cubs making their way down to the water and disappearing into slow-moving wakes as they started to swim, and even lone males moving steadily across high plateaus, getting harder and harder to find again in binoculars as it started to snow. Pro-tip: Polar bears are generally best viewed during the brief summer season. One of the things the Arctic has over the Antarctic is that it’s an incredible wildlife destination -- a region where you can see not just polar bears, but musk ox, arctic fox, arctic hare, seals, whales, maybe even narwhals. (Narwhals aren’t likely, TBH, as they’re an exceedingly rare sighting, but perhaps you’ll be one of the lucky ones.) If you’re mostly interested in wildlife, Quark offers focused packages that get you tracking down your favorite critters. If your bucket list includes seeing the eerie, magical Northern Lights, you’re in luck. The best time of year to see them is around September and October when the sky begins to darken as winter takes hold, and then again around March and April. My first night on the ship was all cloud cover and fog, and when I stepped outside to get some (very cold) air, the sky was the darkest I have ever seen, as if my eyes were closed. A few days later, the skies cleared and everyone got what they really came for. Even the crew, who see the lights regularly, was awed by their brightness. I was not at all prepared for the massive scale of the Northern Lights, for the color bands to dominate the night sky and stretch from one horizon to the other. I’ve always been drawn to them as an idea, partly because I like thinking of them as a view our planet shares with other planets and partly because of the 1995 live-action/animated classic Balto. Before that night I’d also been unconsciously assuming that the lights were essentially either on or they weren’t, according to the strength and direction of solar winds and whether the day’s solar eruptions had been sufficiently … big or something. This is not quite how it works. The lights are brighter right after increased sunspot activity, and at certain points in the solar cycle (which operates in years, not months, so don’t overthink that one too much) but they are “on,” so to speak, pretty much all the time. Whether or not the human eye can see them depends on location and, how clear and dark it is at night. You can see the utility, then, of viewing the lights onboard a ship in a remote, unpopulated fjord. So who does live there? The vast majority of Greenland’s population — 88 percent — are Greenlandic Inuit. The community of Ittoqqortoormiit has a population of around 450, and a morning spent visiting is the only non-cruise human interaction you’ll have the whole trip. You can look through the museum (which houses a hunter’s settlement, paintings and costumes), interact with a sled dog or two and watch them get fed, meet locals and ideally purchase some artisanal goods. Egede says one issue facing Greenlandic Inuit is the European Union’s trade ban on sealskin products, but an Inuit exemption allows them to sell sealskin wares. Still, the industry has suffered a crash because this information is little known. The “encounters with locals” portion of organized tours are frequently bungled and misguided, at best cringey and at worst nakedly exploitative and racist. It is with a colossal amount of relief that I report Quark’s was not these things. This visit doesn’t include anything potentially invasive like looking inside people’s homes, and the crew is conscientious about briefing passengers beforehand about proper etiquette, having lived and/or spent time in the community and being friendly with its residents. It’s the ideal way to see Greenland, in smallish groups led by people with a connection to the places you visit, with most of your time spent on the water. 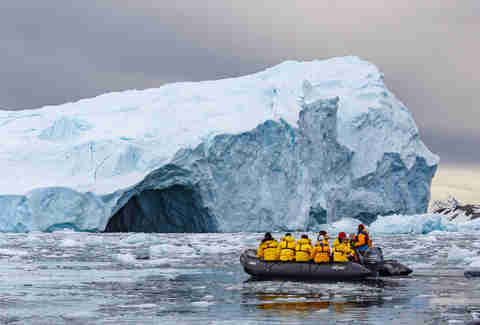 The cost of the writer's cruise package was covered by Quark Expeditions.